Thanks for the peaceful environment, I have a nice sleep. Beds are comfortable. Staff were good. Price was good. Location was close to shops, eateries etc. 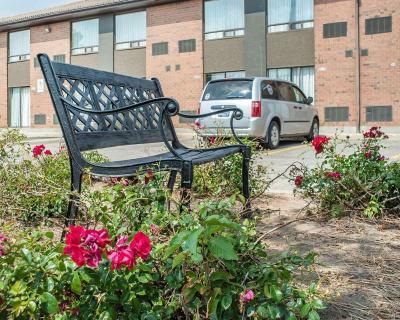 Pet friendly ground floor rooms have patio doors direct to outside so convenient for bringing dogs in and out. Great staff, friendly, clean, prompt courteous service at the hotel and the restaurant, Angel’s .The Food was wonderful .. the room clean and fresh . Minutes to uptown , plenty of parking. Easy access to the rooms because of only two floors. 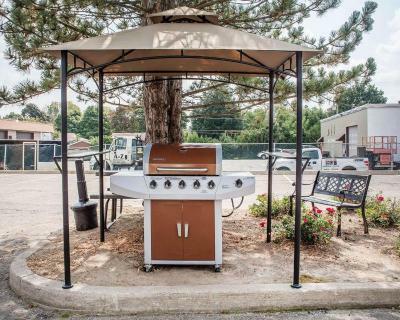 Good location close to restaurants and grocery stores. Front desk staff was extremely helpful, and efficient. She was very informative and personable. Angels Diner (attached to Inn) had a nice menu l, prompt service, friendly staff and we really enjoyed our meal. there was coffee and water at front of doors if you liked the guy and lady were nice at front deck. 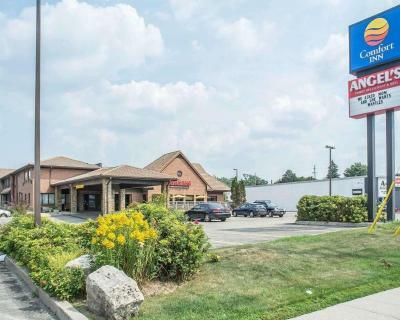 Comfort Inn Waterloo This rating is a reflection of how the property compares to the industry standard when it comes to price, facilities and services available. It's based on a self-evaluation by the property. Use this rating to help choose your stay! One of our best sellers in Waterloo! This Waterloo, Ontario hotel is ideally located close to area attractions, including the University of Waterloo, and features comfortable accommodations, complete with many of today's modern conveniences. 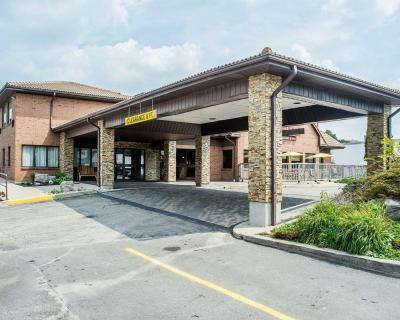 The nonsmoking Comfort Inn Waterloo places guests only a short distance from a variety of popular points of interest. Many major companies, such as Google, as well as the local farmers market, museums, and universities are in close proximity. 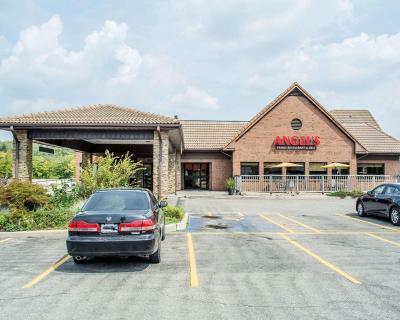 Serving pub-style food and breakfast, Angel's Family Restaurant is attached to the hotel. Guests can enjoy 10% off at this restaurant. 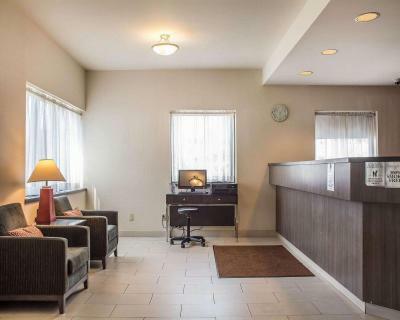 The pet-friendly Waterloo Comfort Inn provides guests with a number of thoughtful amenities. 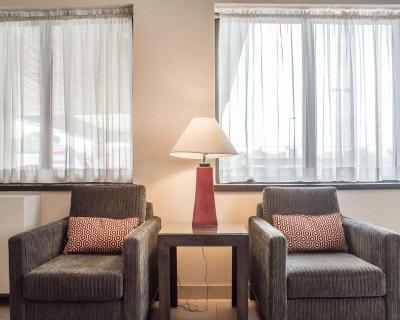 Enjoy complimentary tea and coffee in the lobby, free wireless internet access and 32-inch, flat-screen TVs. 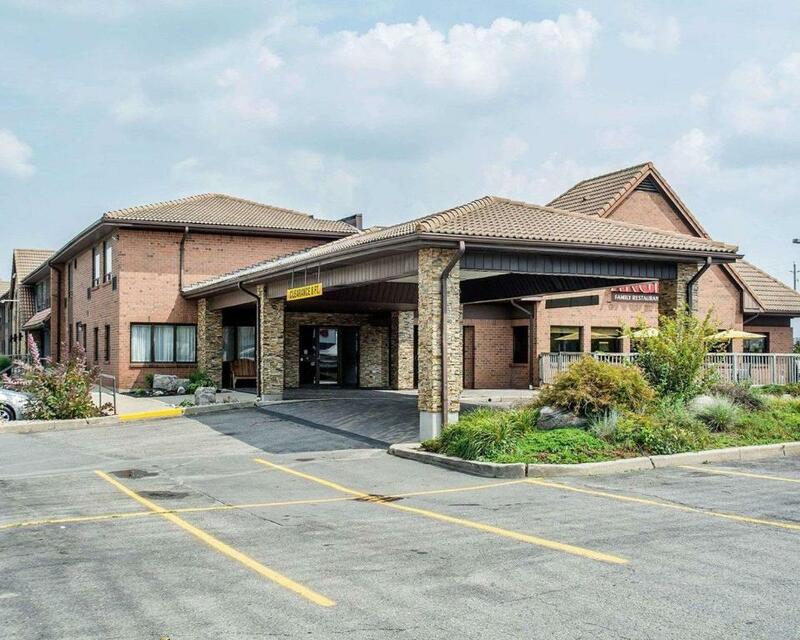 When would you like to stay at Comfort Inn Waterloo? This 2nd floor room has free WiFi access, a refrigerator and a 32-inch flat-screen TV. 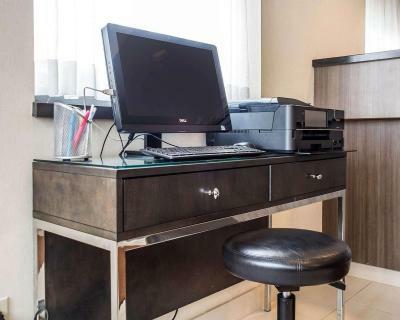 This ground floor room has a refrigerator, microwave, 32-inch flat-screen TV and free Wi-Fi access. This room with a king bed has a refrigerator, microwave, 32-inch flat-screen TV and free Wi-Fi access. This hotel is owned and operated by Westmont Hospitality. 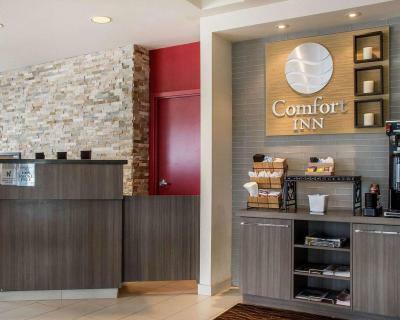 House Rules Comfort Inn Waterloo takes special requests – add in the next step! Comfort Inn Waterloo accepts these cards and reserves the right to temporarily hold an amount prior to arrival. Please note that guests will receive a 10% discount at the on-site Angel's Family Restaurant when presenting their room key. This offer does not apply to any food or beverage specials. Hair in the bathroom, so not cleaned properly nor was the room itself as there was rubbish near one of the beds and on the floor. Plugs in VERY inconvenient places. A kettle would have been useful as not everyone is a coffee fiend! Children using the corridor as a playground wasn’t great either. Location was convenient for our purpose. The bath unit was a work of plastic genius!! Fridge in room, along with a microwave. Despite smoke free room it was clearly smoked in. Lack of elevator (even though there are only two floors) might be a challenge for some people. This was our 4th stay at the hotel over the past few months. On our most recent visit, there appears to be new staff who clearly don't know how to do their jobs. Spending 5-10 minutes on their cell phone, asking how to do basic functions at the booking computer, and preferring to answer phones than deal with guests lined up at the desk. Their customer service is cold, bordering on rude. And they didn't seem interested in providing any form of receipt - all that mattered to them was taking your money. Location is ideal for visiting universities. Rooms are dated, but reasonably comfortable. Check in Staff was on phone for three minutes seemed personal call.. Second no room ready as there was a staffing issue that day and she had 6 people to check in without clean rooms. She talked on the phone to someone, and got a resolution. Within 30 minutes a gentlemen entered my room using a key and was expecting to stay in the room I was assigned. I was dressed at the time, but not good. Maybe the lobby coffee, was from a Nescafé machine, tastes like instant. Extremely friendly reception staff, wonderful bedding, really nice toiletries, fluffy towels. I likes being able to get in and out by our patio, and park the car right there. My husband and daughter (18 ) was disturbed in the night by people coming back late 2-3 am and banging making very loud noises next door to them so It was hard for them to resume sleep. They did mention it at checkout and got 30% off their stay. Nice and clean comfy rooms, close to university. Stairway smells, room was freezing upon arrival, too expensive for what the hotel has to offer. Comfy bed, clean, location, restaurant attached. The cleanliness and the details in the rooms. Needing a credit card to pay plus deposit when wanting to use debit. Also it takes 2 days to get deposit back. Price was too high as the rooms were outdated, heat was slow to work. Staff was friendly, location was convenient.